Murray Bookchin’s classic short essay on France 1968 which would “shake the foundations of bourgeois society in France”, it raised issues and posed solutions of unprecedented importance for modern industrial society. Lately I have been focusing on recent events in France – the conclusion to the Tarnac trial and the police attack on the ZAD autonomous zone near Nantes. Now it is time to commemorate the 50th anniversary of the May-June events in France in 1968, an audacious attempt at an anti-authoritarian social revolution in an advanced capitalist society. 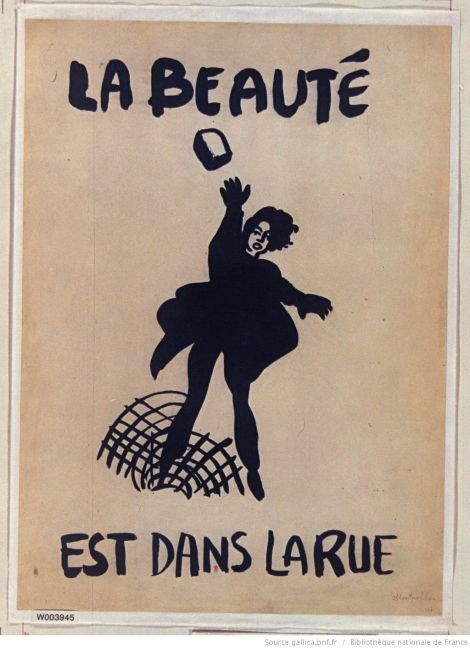 The French anarchist paper, Le Monde Libertaire, has just published a special issue on May 1968. Here I reproduce excerpts from Murray Bookchin’s reflections on these events, written within weeks of the uprising, and included in Bookchin’s classic collection of anarchist essays, Post-Scarcity Anarchism. It’s important to emphasize the anarchist influences in the May-June events, because with the 200th anniversary of Karl Marx’s birth coming in the same year as the 50th anniversary of May 1968, much commentary has focused on Marxist influences on the May-June events when, as Bookchin notes, the various Marxist parties were completely taken by surprise by these events, and if you go back to read Marxist responses to the events at the time, they mainly bemoaned the failure of French students and workers to let themselves be led by the umpteen “vanguards of the proletariat” in France at the time, the various Marxist political parties marching backwards into the future under the banner of Marxism-Leninism. This is something the Cohn-Bendit brothers brought out beautifully in their book, translated into English as Obsolete Communism: The Leftwing Alternative. The French title would be better translated as Leftism: Remedy for the Senile Disease of Communism, a parody of Lenin’s notorious pamphlet, “Left-Wing” Communism: An Infantile Disorder. I included excerpts from the Cohn-Bendit’s book in Volume 2 of Anarchism: A Documentary History of Libertarian Ideas. Noteworthy in Bookchin’s essay is how radical he was in 1968 – an unabashed anarchist calling for a far reaching social revolution. I included several of Bookchin’s anarchist writings in Volumes 2 and 3 of the Anarchism anthology. The 1968 May-June uprising was one of the most important events to occur in France since the Paris Commune of 1871. Not only did it shake the foundations of bourgeois society in France, it raised issues and posed solutions of unprecedented importance for modern industrial society. It deserves the closest study and the most thoroughgoing discussion by revolutionaries everywhere. The May-June uprising occurred in an industrialized, consumption-oriented country—less developed than the United States, but essentially in the same economic category. The uprising exploded the myth that the wealth and resources of modern industrial society can be used to absorb all revolutionary opposition. The May-June events showed that contradictions and antagonisms in capitalism are not eliminated by statification and advanced forms of industrialism, but changed in form and character. The fact that the uprising took everyone by surprise, including the most sophisticated theoreticians in the Marxist, Situationist and anarchist movements, underscores the importance of the May-June events and raises the need to re-examine the sources of revolutionary unrest in modern society. The graffiti on the walls of Paris—”Power to the Imagination,” “It is forbidden to forbid,” “Life without dead times,” “Never work”—represent a more probing analysis of these sources than all the theoretical tomes inherited from the past. The uprising revealed that we are at the end of an old era and well into the beginning of a new one. The motive forces of revolution today, at least in the industrialized world, are not simply scarcity and material need, but also the quality of everyday life, the demand for the liberation of experience, the attempt to gain control over one’s own destiny. It matters little that the graffiti on the walls of Paris were initially scrawled by a small minority. From everything I have seen, it is clear that the graffiti (which now form the content of several books) have captured the imagination of many thousands in Paris. They have touched the revolutionary nerve of the city. The revolt was a majority movement in the sense that it cut across nearly all the class lines in France. It involved not only students and workers, but technicians, engineers and clerical people in nearly every stratum of the state, industrial and commercial bureaucracy. It swept in professionals and laborers, intellectuals and football players, television broadcasters and subway workers. It even touched the gendarmerie of Paris, and almost certainly affected the great mass of conscript soldiers in the French army. The revolt was initiated primarily by the young. It was begun by university students, then it was taken up by young industrial workers, unemployed youth, and the “leather jackets”—the so-called “delinquent youth” of the cities. Special emphasis must be given to high school students and adolescents, who often showed more courage and determination than the university students. But the revolt swept in older people as well—blue- and white-collar workers, technicians and professionals. Although it was catalyzed by conscious revolutionaries, especially by anarchist affinity groups whose existence no one had even faintly supposed, the flow, the movement of the uprising was spontaneous. No one had “summoned it forth”; no one had “organized” it; no one succeeded in “controlling” it. A festive atmosphere prevailed throughout most of the May-June days, an awakening of solidarity, of mutual aid, indeed of a selfhood and self-expression that had not been seen in Paris since the Commune. People literally discovered themselves and their fellow human beings anew—or remade themselves. In many industrial towns, workers clogged the squares, hung out red flags, read avidly and discussed every leaflet that fell into their hands. A fever for life gripped millions, a reawakening of senses that people never thought they possessed, a joy and elation they never thought they could feel. Tongues were loosened, ears and eyes acquired a new acuity. There was singing with new, and often ribald, verses added to old tunes. Many factory floors were turned into dance floors. The sexual inhibitions that had frozen the lives of so many young people in France were shattered in a matter of days. This was not a solemn revolt, a coup d’etat bureaucratically plotted and manipulated by a “vanguard” party; it was witty, satirical, inventive and creative—and therein lay its strength, its capacity for immense self-mobilization, its infectiousness. The mystique of bureaucratic “organization,” of imposed, formalized hierarchies and structures, pervades the most radical movements in nonrevolutionary periods. The remarkable susceptibility of the left to authoritarian and hierarchical impulses reveals the deep roots of the radical movement in the very society it professedly seeks to overthrow. In this respect, nearly every revolutionary organization is a potential source of counterrevolution. Only if the revolutionary organization is so “structured” that its forms reflect the direct, decentralized forms of freedom initiated by the revolution, only if the revolutionary organization fosters in the revolutionist the lifestyles and personality of freedom, can this potential for counterrevolution be diminished. Only then is it possible for the revolutionary movement to dissolve into the revolution, to disappear into its new, directly democratic social forms like surgical thread into a healing wound. The act of revolution rips apart all the tendons that hold authority and hierarchy together in the established order. The direct entry of the people into the social arena is the very essence of revolution. Revolution is the most advanced form of direct action. By the same token, direct action in “normal” times is the indispensable preparation for revolutionary action. In both cases, there is a substitution of social action from below for political action within the established, hierarchical framework. In both cases, there are molecular changes of “masses,” classes and social strata into revolutionary individuals. This condition must become permanent if the revolution is to be successful—if it is not to be transformed into a counterrevolution masked by revolutionary ideology. Every formula, every organization, every “tried-and-tested” program, must give way to the demands of the revolution. There is no theory, program or party that has greater significance than the revolution itself. Among the most serious obstacles to the May-June uprising were not only de Gaulle and the police, but also the hardened organizations of the left—the Communist Party that suffocated initiative in many factories and the Leninist and Trotskyist groups that created such a bad odor in the general assembly of the Sorbonne. I speak here not of the many individuals who romantically identified themselves with Che, Mao, Lenin or Trotsky (often with all four at once), but of those who surrendered their entire identity, initiative and volition to tightly disciplined, hierarchical organizations. However well-intentioned these people may have been, it became their task to “discipline” the revolt, more precisely, to de-revolutionize it by imbuing it with the habits of obedience and authority that their organizations have assimilated from the established order. These habits, fostered by participation in highly structured organizations—organizations modeled, in fact, on the very society the “revolutionaries” profess to oppose—led to parliamentary maneuvering, secret caucusing, and attempts to “control” the revolutionary forms of freedom created by the revolution. They produced in the Sorbonne assembly a poisonous vapor of manipulation. Many students to whom I spoke were absolutely convinced that these groups were prepared to destroy the Sorbonne assembly if they could not “control” it. The groups were concerned not with the vitality of the revolutionary forms but with the growth of their own organizations. Having created authentic forms of freedom in which everyone could freely express his viewpoint, the assembly would have been perfectly justified to have banned all bureaucratically organized groups from its midst. It remains to the lasting credit of the March 22nd Movement that it merged into the revolutionary assemblies and virtually disappeared as an organization, except in name. In its own assemblies, March 22nd arrived at all its decisions by the “sense of the assembly,” and it permitted all tendencies within its midst to freely test their views in practice. Such tolerance did not impair its “effectiveness”; this anarchic movement, by the common agreement of nearly all observers, did more to catalyze the revolt than any other student group. What distinguishes March 22nd and groups such as the anarchists and Situationists from all others is that they worked not for the “seizure of power” but for its dissolution. While I think Bookchin writes reasonably well and has some interesting things to say, my impression of his central concept of post-scarcity is that it is not very useful (except as a gloss for consumerism) or accurate (capitalist over-exploitation of non-renewable resources means passing peaks and sliding downwards). where she says that women were often relegated to making the tea for male revolutionaries, and Algeria and Indo-China were hot topics within an international (anti-imperial) context. So the image of a female (possibly) cobblestone-chucker is perhaps somewhat misleading.